Alchemical Dwarves: An unusual and alien species of Dwarf found in the Country of Sang. Arthopods from Nowhere: There is a place that the inhabitants call Zrgztl, but you might as well call it Nowhere because it's here and not here all at the same time. Motley Isles: The islands are known as a haven of pirates who value their freedom above all else, except perhaps the plunder they take from hapless ships. Vessels that call the Motley Isles their home often fly a distinctive flag: a skull and crossbones emblazoned on a crazy-quilt pattern. Shooting Star Folk: A vagabond and rowdy bunch, who are generally not welcomed among the Stars and Planets that comprise polite society of the heavens. They are forever crashing into things, (Planets, Stars, each other) and despite the danger, consider it a great thrill to do so, burning bright and screaming to the void. Velocipede Gangs: In the eastern plains of the Country of Yanth in the Land of Azurth, there are nomads with an unusual mode of travel. A manor house dominates the only hill on a small island in the middle of the slow-moving Lazybones River, barely visible behind a perpetual bank of heavier-than-normal Bewilderlands haze. A noble family and all their servants, rendered into a hideous undeath millennia ago by a sorcerous curse, carry on as if nothing has happened. When posthuman intelligences began dismantling planets to build rudimentary Matrioshka brains, the apotheosis refusenik near-human remnant was cast out of their reservations to space habitat redoubts. Most of these continued in the relatively carefree people had lived on the now-recycled worlds, but in a few something went wrong. Sometimes very wrong. The Weal (as the inhabitants now know it) is one of those places. After war and perhaps a period of utter barbarism, a roughly Medieval technology level society has emerged (amidst the half-functioning remnant of what came before) of androids (though they would think of themselves as "people," thank you): the artificial biologic beings once servants and playthings for the idle human rulers. Being an android has some advantages, not the least of which is the reality of resurrection, if you are attended to by the appropriate authority (i.e. super-user). 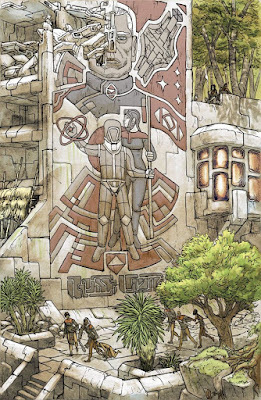 These post-human people have developed into tribes that carry some echo of their previous function: the clerics receive wisdom from the old god-machines, the fighters still hold as their sacred duty the protection of the Weal, and the wizards broker deals with spirits and command the various nanomachines and utility fogs gone quiescent or feral after their former masters forgot the eldritch codes to command them. All these tribes or fraternities wind up battling monsters. Their is only so much space in the Weal, and the people need it. The lower, outer levels are the abodes of creatures once human (altered into strange forms by adaptive and cosmetic gememods gone wildly off model by natural selection unleashed), nanotech that will not be tamed, and in the outer, deepest levels there are posthuman sociopaths and grifters trying to break in. The Weal is a dangerous place, but intrepid heroes can claw back the world from darkenss or die in the attempt. Marduk, the Theocrat of Pandarve, has had his scientists and magicians hard at work at creating a device to bring someone called "the Anomaly" to him over a great distance. He places the last element needed into the device: a red sphere called the Egg of Pandarve. An energy beam shoots out across unimaginable distances and arrives on Earth, striking Storm and causing him to disappear. Ember jumps into the beam after him and disappears as well. Storm and Ember find themselves in orbit around a planet, falling slowly, yet someone able to breath. They have arrived near Pandarve at least, but this isn't exactly what the Theocrat wanted. His technicians are looking for them, but a rebel attack disrupts their power supply. The "Anomaly Detector" tells Marduk that the object of his search has arrived in the system at least. 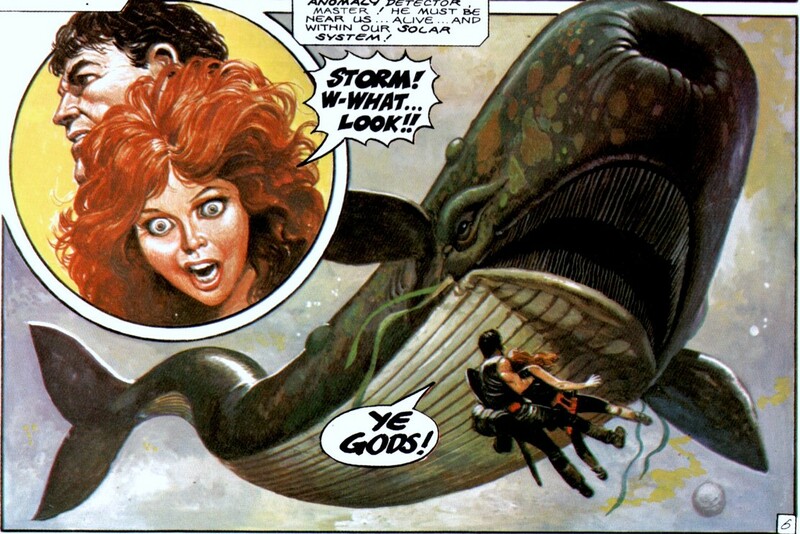 Staring down the maw of some sort of space whale, Storm and Ember push away from each other. the force carries each of them out of the creatures path but on opposite sides. The hunter reels the creature in closer, then fires another harpoon. Our 5e Land of Azurth game continued last night with the first session in an adaptation of X2: Castle Amber. While the PCs had been getting used to their being a new mayor in town and tying up loose ends from previous adventures, the Elf Ranger Shade had received a visit from her mother, Oona whom she hadn't seen in one time. Oona told her it was time for her to visit her family in their manse and fulfill her familial obligation to house Sylaire (obligations her mother had notably fled herself all those years ago) and perhaps set right what has gone wrong. Shade is reluctant to reveal all of this to her companions but ultimately, she does. They accompany her to the Aldwode on a night of the new moon to find the phantom House Perilous, the home of the Sylaire clan. 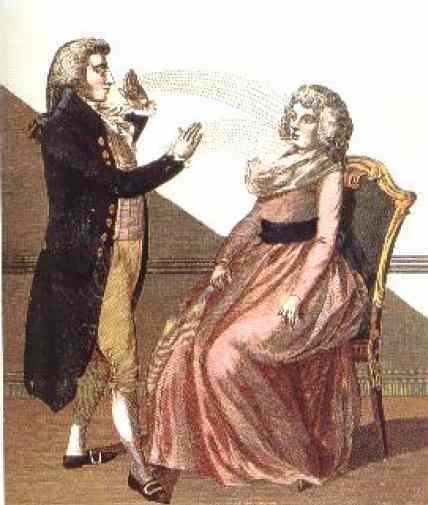 To save her from the unwanted marriage they are sure is coming, they do a hasty marriage of dubious legality to the bard Kully. The party finds an iridescent salamander in a clearing and the creature tells them to walk widdershins around the area, then sleep the night with no light sources. They do as the the creature bids them, and they wake up in the foyer of the house. In the salon, the rakish Jereth and his waxen pugilist offer them a wager. Against Shade's warning, Erkose takes him up on it, and knocks the creature out in under 2 rounds, winning them 500 gold. 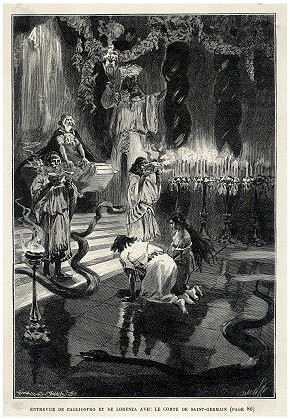 Jereth suggests to Shade that the grand matron, Carmilla, might wish to see her and "do a reading of the cards." 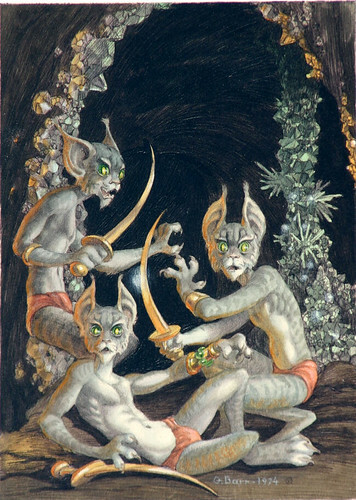 In the study they encountered strange cat men who wanted only to sleep and warned the party off with hisses and curved daggers. In the banquet hall, the party declines to eat with the elegant, fancy-dressed phantom dinners. Waylon and Erekose did feed some roast beef to the cat men, to no visible effect. In the Mirror Hall, half the party is blinded for an hour. 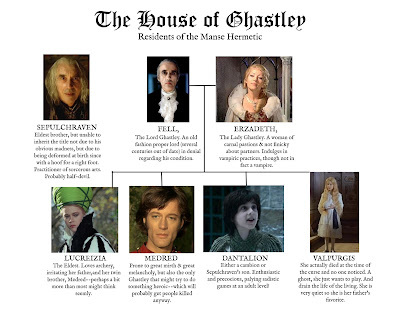 They encountered a leprous looking servant (a thoul) who leaves them be when Shade invokes her mother's name. They avoided the other rooms in that wing and went into the indoor forest. Again, they mostly stayed clear of trouble, keeping to the path. Erekose's greed was enticed by a chest ensconced beneath the gargoyles in the fountain, and he and Waylon contrived to get the chest without entering the water. The chest scraping across the bottom, however, roused the ameba lurking there, and it attacked. The party lit it up with blasty cantrips and drove it back. As the party peered at the riches in the chest, a feminine voice from behind them asked just what they were doing. Synopsis: The astronauts launch a raid against a Kreeg religious shrine in a White Sands Missile Range museum and acquire a new weapon. Commentary: Google maps makes getting a map of a real world location a whole lot easier than in the pre-internet days--if only they had a hexgrid overlay! 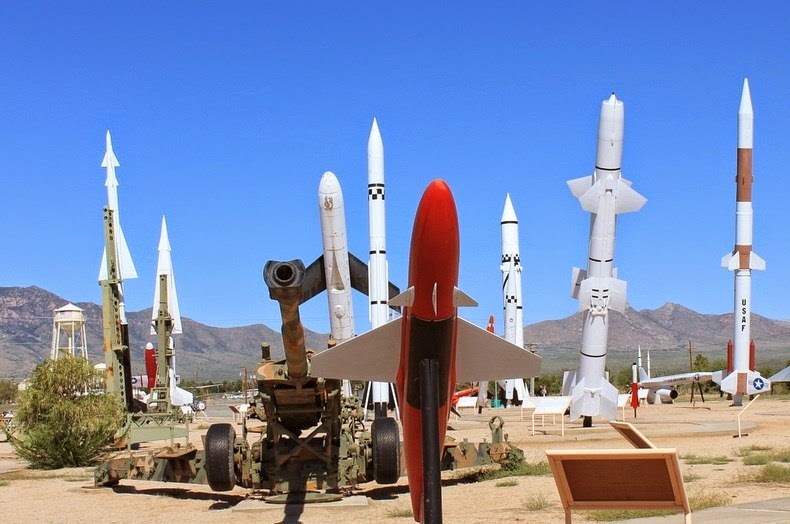 The White Sands missile Range Museum is, of course, a real place. Through the magic of suspension of disbelief, it was buried by sand rather than eroded by the millennia and the mutants were able to dig it up. With it's machine gun the gang turned the Kreeg church meeting into a lower budget version of the climatic gun battle in the Wild Bunch. 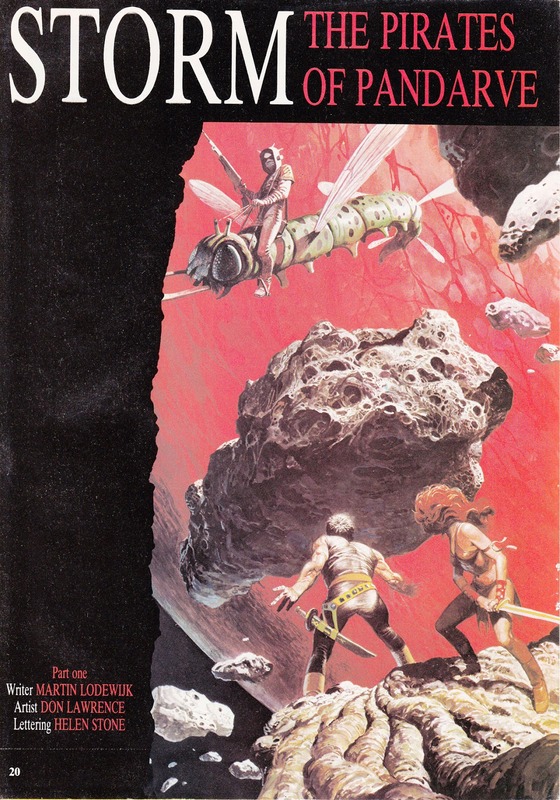 In my gaming career, I haven't ran too many published adventures. When I was younger and had a lot of time, there didn't seem much point. These days, I can definitely see the appeal. I've run more since starting this blog than I did in all my gaming years prior, I think. The problem is, either I'm too particular or my settings are such special snowflakes that it still takes a good bit of forethought and prep for me to be happy with them. In my Weird Adventures game, Castle Amber only wound up serving as inspiration to swipe a couple of rooms from for a sprawling, haunted estate. Jason Sholtis's Zogorion, Lord of the Hippogriffs was so freely adapted that the session served as the basis for Mortzengersturm, the Mad Manticore of the Prismatic Peak. I tend to alter them so much that I'm pretty picky about the fodder I start with, if only to minimize that tendency. I wonder if other people have that problem? 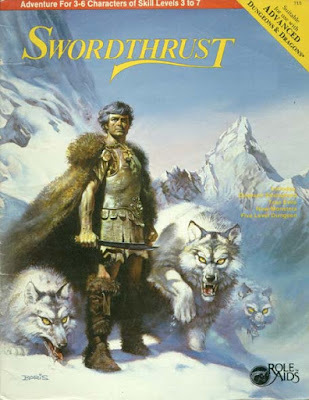 Do other folks with particular settings/campaigns just alter them to accomodate the "facts" of the published adventure or do adaptations like I do? Cog was mentioned in my play reports previously. Will take a breather here in the Storm series, before heading off to Pandarve to consider to comics collections I scored in my holiday gift haul. I've been (slowly) picking out Fantagraphic's E.C. Seegar's Popeye collections, and I got the last two volumes I needed. 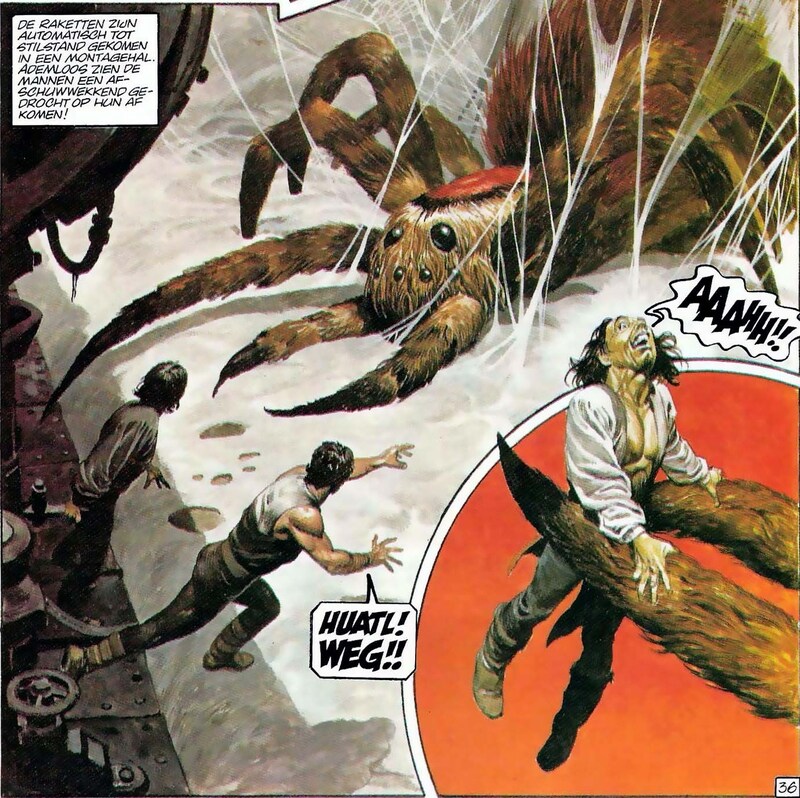 Volume 4: Plunder Island includes the titular storyline, often considered to be the best of the series, which features the Sea Hag and introduces her goon henchman, including Alice. 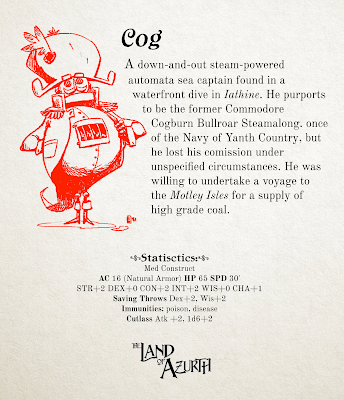 Volume 6 is the last one and features a return of the Sea Hag, among other things. Both collections are original size and up to Fantagraphics usual production standards. 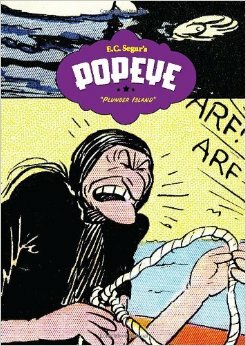 Popeye's Depression era adventure fantasy was an sinspiration for Weird Adventures. 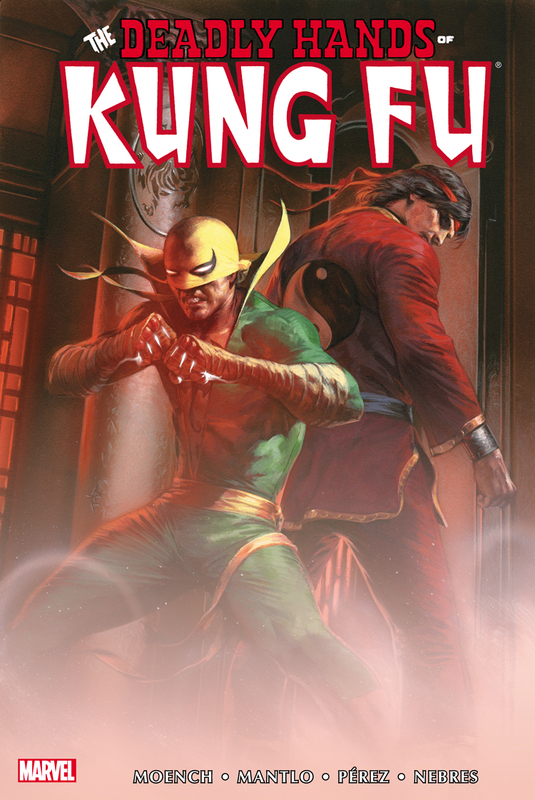 The Deadly Hands of Kung Fu Omnibus was not technically a gift, but I picked it up during my holiday shopping, so it was kind of a gift to myself. 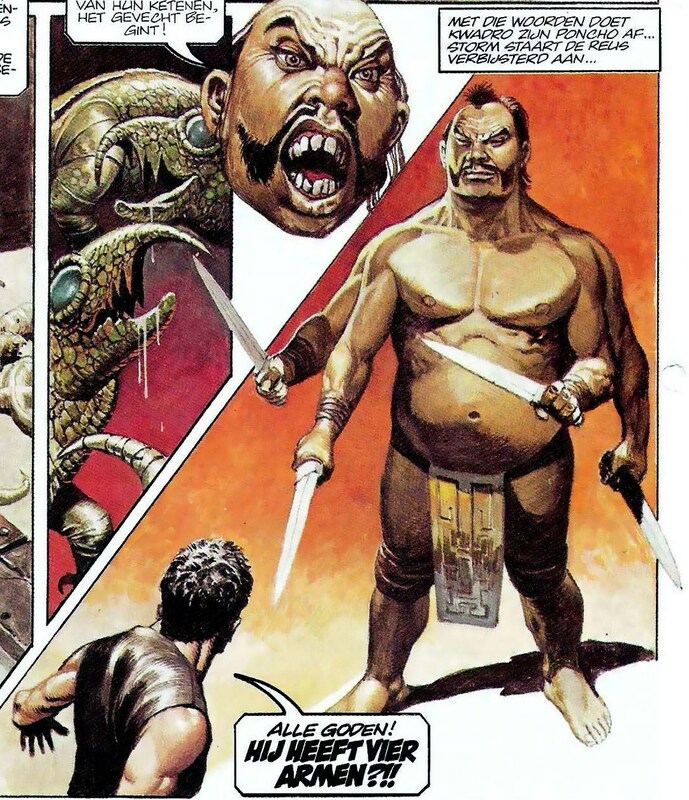 This reprints material from Marvel's black and white The Deadly Hands of Kung Fu magazine. 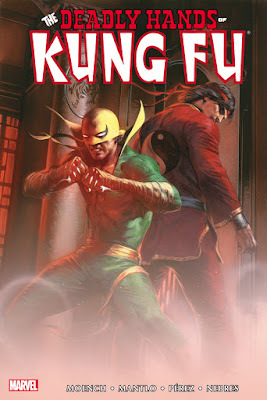 It features Shang-Chi, Iron Fist, and the Sons of Tiger, and the usual Marvel magazine topical articles. The stories feature art by the likes of Paul Gulacy, Rudy Nebres, and Jim Starlin. Circus registry 331/3 (called by its operators Thirty-Three and A Third) is a Universal Standard Transport LS1517 series space hauler. 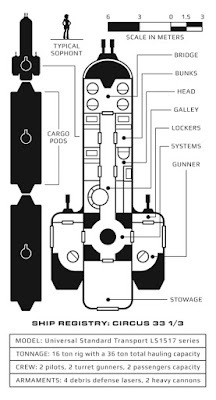 The LS1517 series is often used as a pilot engine for a train of container pods with the primary motive power coming from a secondary drive at the end. The series is an older design with a higher crew (or more sophisticated nonspohont mind) than new models and only one axis of container attachment, but it has better armaments (ostensibly "space debris protection") and a more powerful engine. The above diagram will appear in Strange Stars OSR. The base Rogue class in 5e works fine as does the thief & assassin archetypes. 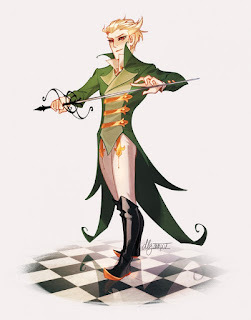 The Arcane Trickster has so nice features that could maybe form the basis of a "magical trickster" or charlatan (wherein the magic is feigned or pretended), but as currently constituted it's too magical. 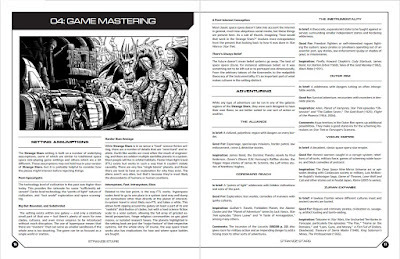 The Mastermind and the Swashbuckler archetypes from the Sword Coast Adventure's Guide work too, the the latter would be a bit of a relic. Rogues would also be the class of choice for "Thief-takers" working on the opposite side of the law. Obviously musicians and performers have always existed, but the inspirational "powers" of this class seem better suited at a time of revolutions for rabble-rousers, speechifiers, and pamphleteers: your Samuel Adamses and Thomas Paines.. The Warden class of AiME seems to get closest to this range of types without the use of spells, so it's probably a good bardic substitute. 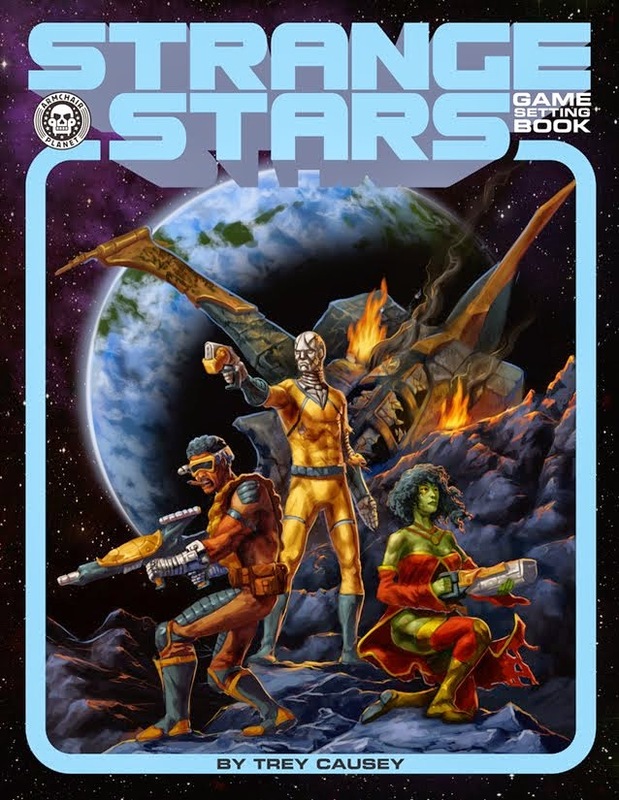 Strange Stars OSR is getting close to release! To prove these words are true, here's the Gamemastering chapter. 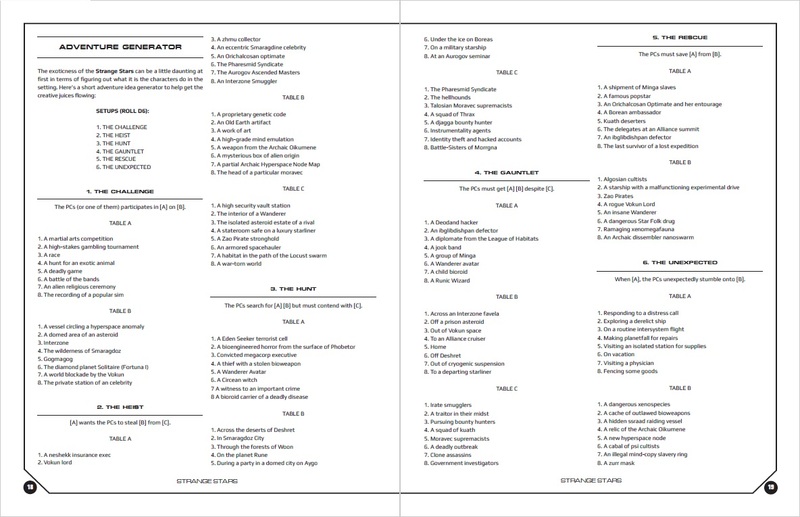 Some minor edits and typo-fixes aside, this is what it will be in the finished product. George Lucas's Willow is no Star Wars. Even though its made from the same sort of stock characters and the same sort borrowings from early sources, but it doesn't quite come together in the same way. At least it didn't seem to to my fifteen year-old self, and it doesn't seem to to me today. Here's the titular hero and (I believe) one of his Nelwyn fellows. Nothing of the pastoral gentility of a Baggins, nor the too literal "small folk" of the film. 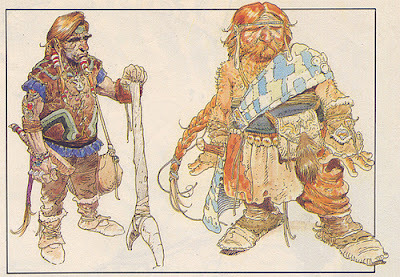 These guys make me think of Howard's diminutive and declining Picts in "The Lost Race," but also aboriginal peoples like the Emishi (in Princess Mononoke) or Ainu. A sense of the Nelwyn threatned by humanity (or Daikini) would have been nice. I like the long earlobes, too. 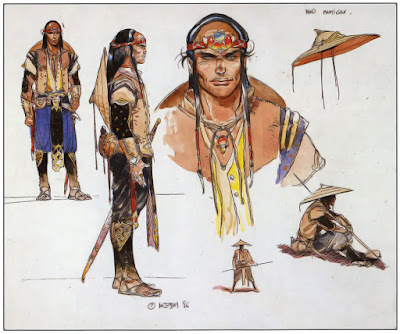 Madmartigan is the rogue with the heart of gold Han Solo type, but with a bit more wastrelness, he could have been a wuxia sort of character, or Sanjuro from Yojimbo, or Mugen from Samurai Champloo--both of which are great swordsman, too. Moebius gives us a design that completely fits with those characters, suggests a world of ronin or wandering swordsmen of some sort. 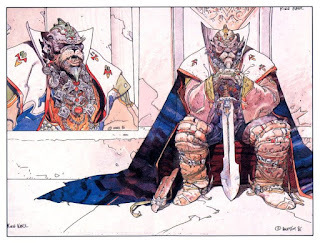 King Kael here (General Kael in the film) is described as "bestial" in the third draft of the script, which he obviously is here. 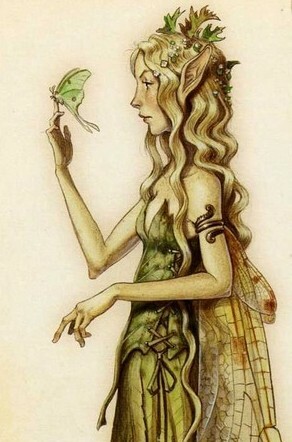 Perhaps he is a lover of Bavmorda transferred by her magic? A reverse Beauty and the Beast (there's maybe a bit of Cocteau's beast about him. Maybe)? Or is he the captain of the flying monkeys, so to speak? Anyway, he fulfills a bit of a Witch-King of Angmar role, so fleshing out his badass villainy would have been good. Now, it's back to the Asian stylings. 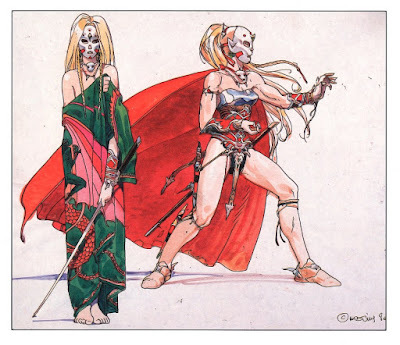 The mask suggests (to me) childhood mindwarping courtesy of Bavmorda for the warrior woman Sorsha. Maybe she's just go a slight blemish, but has been convinced its a horrible disfigurement a la (some accounts of) Doctor Doom? Maybe her inhuman beauty as a daughter of the Tuatha de Danaan-esque folk of Tir Asleen is her disfigurement to her witch queen mother? Note that the mask isn't just a human mask, it's go that single Oni horn. Probably means something. 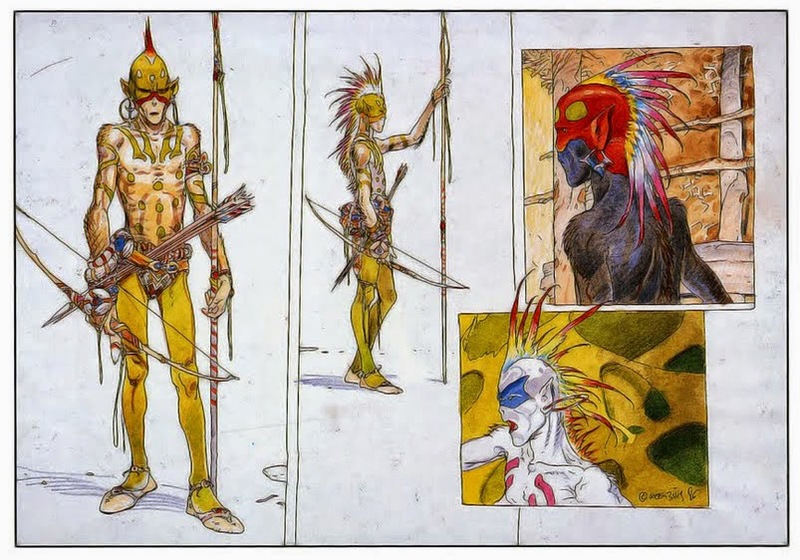 Lastly, I believe this is one of two fairly divergent designs Moebius did for the brownies--but in an earlier script draft Willow and baby get captured by elves who are described as wearing "samurai-type outfits and angry little haircuts." These are guys who (in the script) collect baby tears as part of their gig. Now think of these sinister little guys, like a mashup of the Indian in the Cupboard and the evil faerie of del Toro's Don't be Afraid of the Dark remake. I think we could do without the French accent Lucas specifies for their leader, though. Ember is suspended over hot coals. Kai gloats that by the time the gods appear tomorrow, she will be charred to bone. 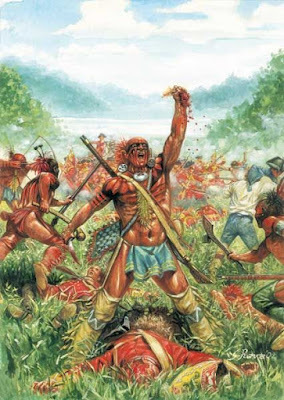 The next day, everyone is assembled and the missiles they call gods rise as usual--but with them are Storm and Huatl! Storm demands Kai honor his father's agreement. Kai refuses and orders Ember's ropes cut so that she will fall into the pit, but Storm has a trick up his sleeve. He pushes the button on a remote control he had kept hidden, launching one of the god missiles. The townsfolk fall prostrate with superstitious awe. Kai snatches up the axe to do the job himself, but Storm braces the falling Ember. Still, both are left defenseless against another attack from Kai. At that moment Huatl challenges Kai and quickly kills him before he can react. 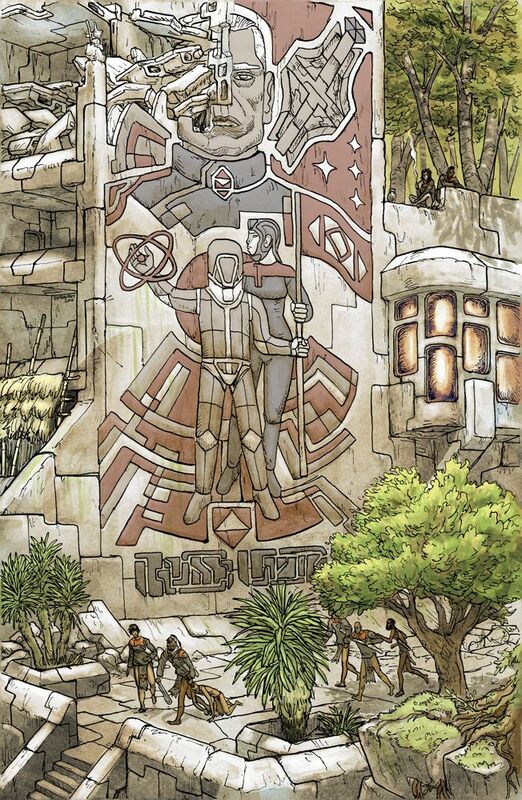 Storm declares that by their law, Huatl is now leader of both tribes, and a new age of peace can be ushered in. After a week of festivities where Storm and Ember are the guests of honor, the two set out again to see what unknown lands lie beyond the horizon. Prophet: I've mentioned my admiration for this series before, so I won't dwell on it here. It's sci-fi superheroes, but much more Dune than Legion of Super-Heroes. It's finished now, and I believe all the issues have been collected. 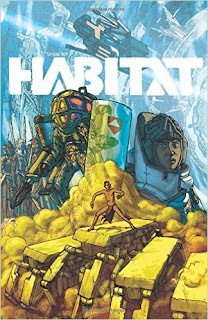 Habitat: Is about life in an isolated orbital habitat, a bit like Starlost but with cannibalism. It's by Simon Roy, co-creator and sometime artist on Prophet. Roy has also done a number of other science fiction sorts that are suitable, some collected in Jan's Atomic Heart and Other Stories. Dreadstar: This is another one I've mentioned before. 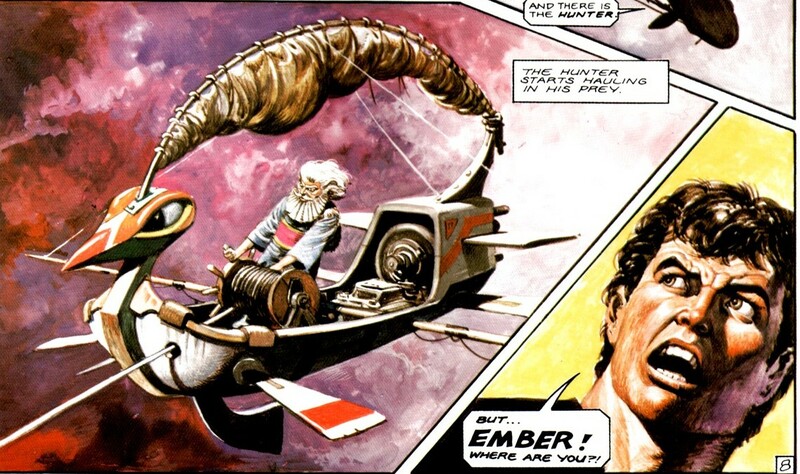 Starlin's space opera is a science fantasy, but its visual style (and its Instrumentality!) influenced Strange Stars greatly. 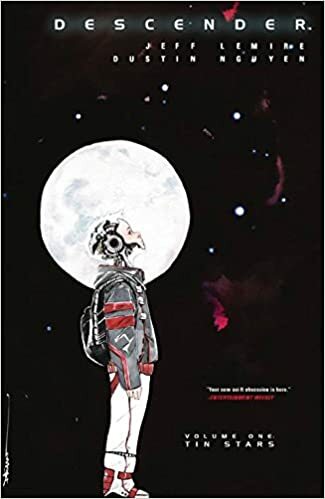 Descender: While the aesthetics aren't the same, Lemire's tale of genocidal super-machines and the adventures of artificial intelligence is great inspiration. The 5e Fighter works pretty well were representing your standard warrior types from any of the cultures, though the Eldritch Knight will be out as an option. Maybe Adventure in Middle Earth's Weapons Master might be an archetype option. 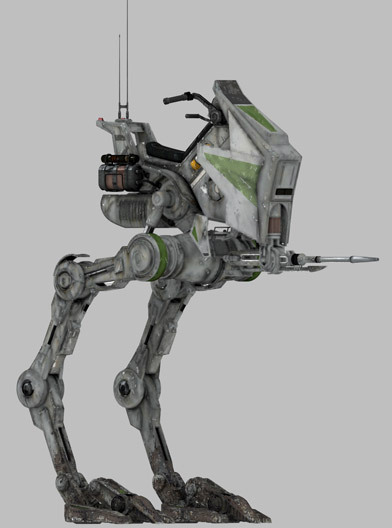 The AiME Wanderer class can represent the historical units known as Rangers, but also the general wilderness scout type. The Hunter of Shadows Archetype is out, but the much maligned Beast Master archetype of the 5e Ranger will work. I might also replace Trackless Step with the Ranger's Land's Stride, but this isn't a big issue. 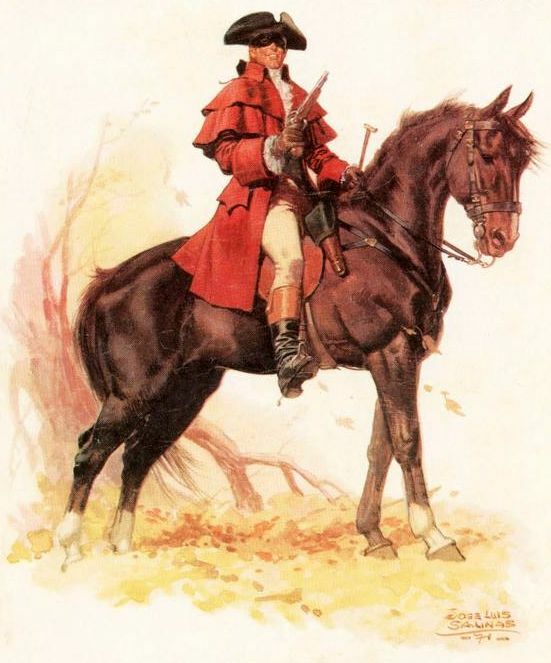 Interesting historical tidbit: the terms for skilled firearms marksmen: "crack shot" and "sharp shooter" (the latter a calque from German) are both attested to from only the 1790s. Though the name is borrowed from the Adventures of Middle-Earth class, I think 5e's Barbarian works better. 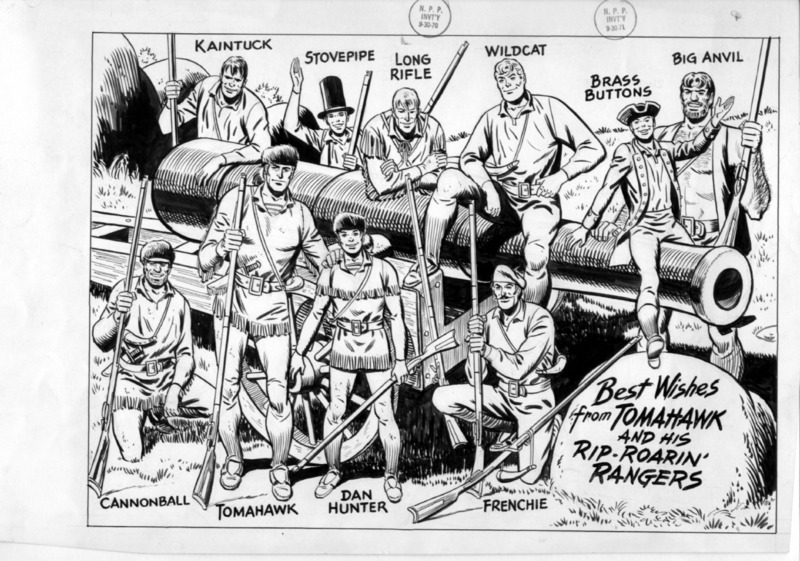 This will represent the fierce, rustic warrior, including some Native American warriors, but also some of the frontiersmen or proto-Mountain Men with which they contended. 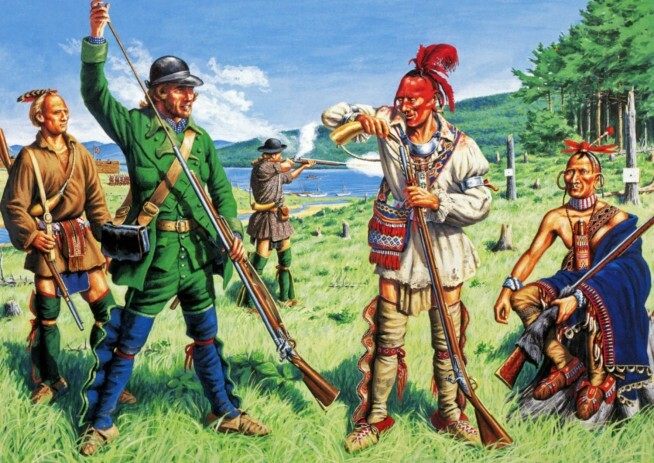 Weapons would be similar for both: muskets, tomahawks/hand axes, and knives, though some Natives might still employ the bow. 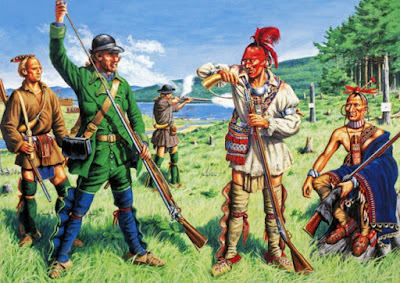 On breaks from getting other projects done, I've been working adapting some of the classes in Adventures in Middle-Earth (due to their low magic setup) for a hypothetical 5e game set in a game in the America Colonies just before the Revolution War. Thinking the fighter classes will (hopefully) but pretty straight forward. 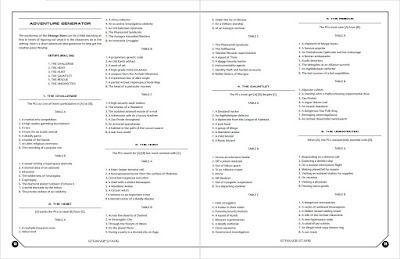 I've started with the (quasi-)magc-using classes. AiME has the Scholar, which is mostly a healer. While conceptually, I might have wished for a nonhealing scholar, the rules sort of require some healing, and this class can reasonable reskinned as the Enlightment version of a sort of Paracelsus alchemist-physician type, possibly with a little of the faith healing aspect of a Valentine Greatrakes, or pseudoscience theorists the likes of Mesmer. I plan to make the two different specialties of the class Master Healer and Master Alchemist (or something similar), which would require a bit of a change. The Scholar's abilities are easy enough to reskin. 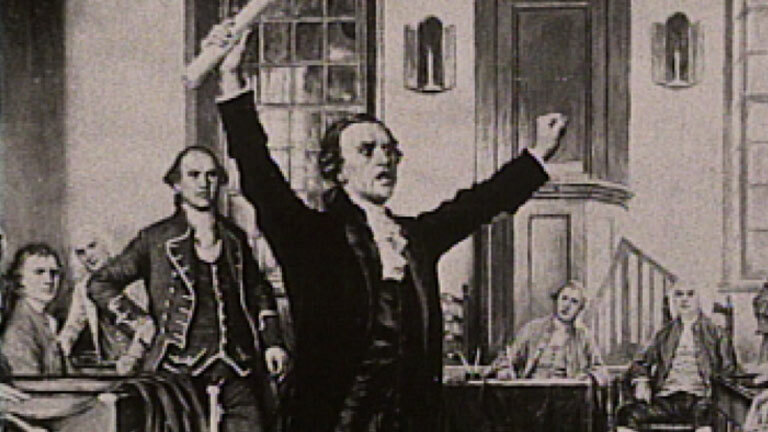 "Hands of the Healer" becomes "Curative Arts," "News from Afar" becomes "The Republic of Letters," and "Tongues of Many Peoples" becomes "Able Linguister." 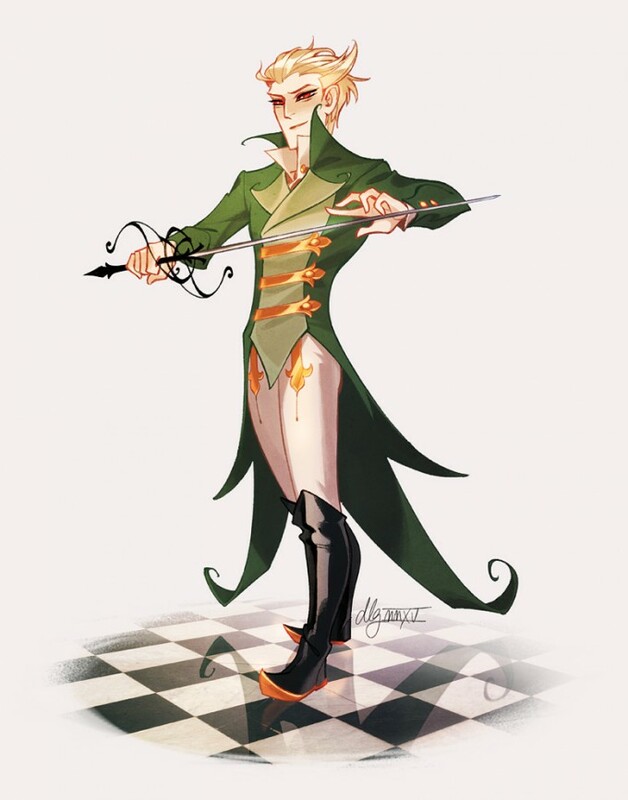 The only class that may need to be largely made from whole cloth is a sort of magic-user to represent the esoteric magic tradition, likely taking advantage of 5e's ritual magic rules, the Magus. These guys will probably have Lodges or Societies to join. 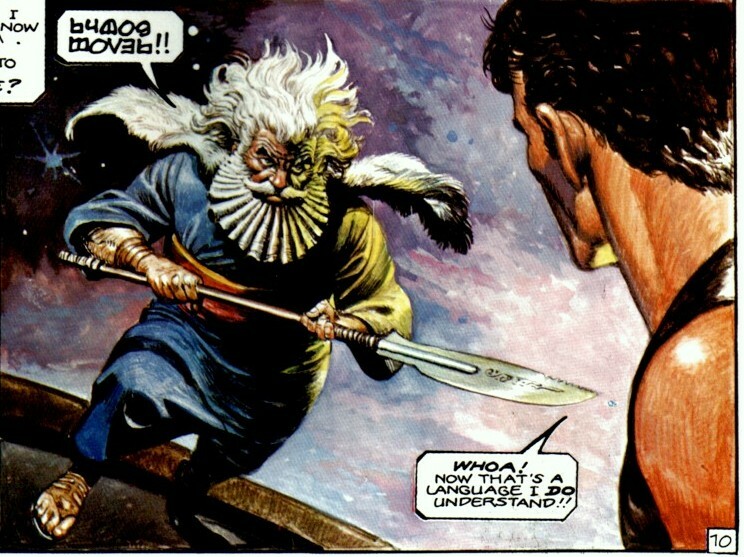 Storm and Huatl, back in the hands of the Manatecs, will be forced to face someone named Kuadro in the duel. At the appointed time, they are led into an arena where ancient missiles risen--worshipped as gods by these people too. Storm is overmatched by a foe with four arms. He's knocked from the walkway but manages to hang on until Kuadro stabs him in the hand. Storm's other hand reaches for something to save him. He grabs a metal bar--which turns out to be a lever. The platform begins to turn. Kuadro is thrown off balance and falls into the pit. Storm is declared the victor and the new leader. Storm demures from the office, offering Huatl in his place--after he returns. Before the Manatec people can respond, the two race into the tunnel the god-missiles emerge from. The two jump on the transports that carry the missiles along a track through the subterranean tunnel. Huatl thinks this all is the work of the gods, but Storm explains that ancient humans made this (though he wonders at what the power source must be). The spider grabs Huatl and begins to enrapt him in webbing. Thinking quickly, Storm wipes grease from the transport's axle so he can climb over the web without sticking. He manages to do that without drawing the attention of the spider and free Huatl. No sooner is that done than the two have to sprint after the transport, which has began moving again. We spent New Year's with my wife's parents, and she really wanted to introduce them to D&D. They are avid gamers of the Catan/Carcassone/Pandemic sort but had never played an rpg. 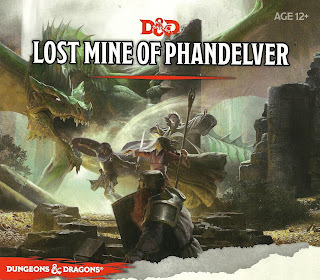 On the way to their place, we bought the 5e Starter Set (mainly to get ahold of the Lost Mines of Phandelver intro adventure), but also for the sample characters. I'm sorry to say Squire Bill the Dwarf Cleric, Maggie the Elf Wizard, and Sara Longstreet the Fighter, were all lost in a goblin den. It was the first TPK of the new year. Hell, it's my first one as a DM in decades, perhaps. 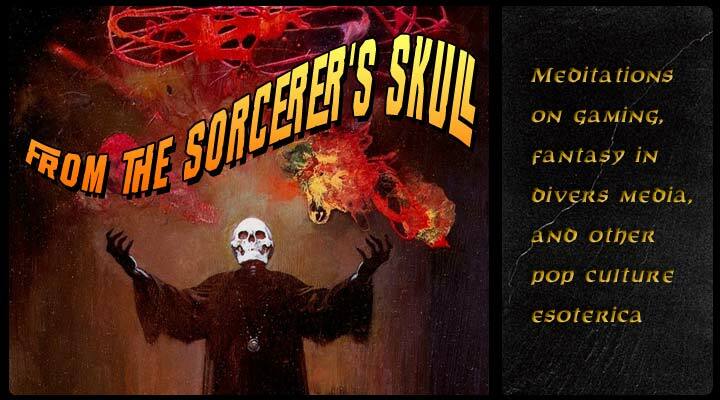 While this was sort of on the fly and an introductory game not the start of a campaign, I did reskin a few thinks to make them more in line with my sensibilities, taking some suggestions from Gus L's critique of the adventure here. The PCs started in media res walking along the road from Knarr to Fandlin, where they know there is to be a festival honoring St. Frithona. I vaguely had in mind a Canterbury Tales riff, and I may differ a bit from Gus in my stance on funny names (I want them to be consistent in a way that suggest culture and interesting, but I do not necessarily see facility of player use as primary concern. If they can't remember them, they can take notes.) so I actually added more than are in the adventure while I altered the ones they were there. So the PCs soon encounter the gruff dwarven outfitter with a secret, Rockseeker Gev, and his associate, Silfer, and soon after, a pilgrim camp with Maudrey (a corpulent merchant), Eilmer (a used car salesman-esque relic seller), Bregwin (a taciturn female fighter with a hatred of goblins), and Karthusa (a nervous tinkerwoman). After Gev and Silfer are apparently kidnapped in a goblin attack--and the player's find a tantalizing but unreadable map to the ruins--they track the goblins back to their lair. In the end, it was mostly bad rolls that took them down and even then it was a close thing: the last PCs was felled by the last goblin in a room who was himself hanging on only by 1 HP. I suppose I should have had the goblin flee at that point to raise alarm (and give the PCs time to maybe attempt escape), but it happened relatively fast and the contest was so close. In any case, the player's seemed to enjoy the game, despite feeling they had "lost" in the end. Being more conformable with boardgames with role-playing the combat was more to their liking than the NPC interaction, so this introductory thing suited them better than one of my adventures might have. 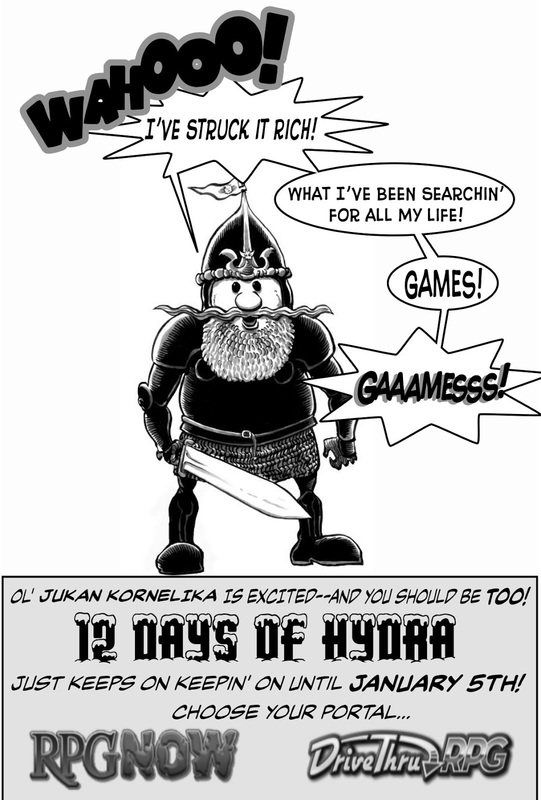 Happy New Year--And Remember the Hydra Sale! A happy 2017 to everyone! Remember there are just four more days of the 12 Days of Hydra Sale. I'm looking forward to release of Strange Stars OSR early in 2017 and Mortzengersturm, the Mad Manticore of the Prismatic Peak a bit later.